They say that the recession is over. Technically that may be correct. However, from the perspective of the individual – and there are still millions of them – who can’t find work, technicalities are not important. Recession proof jobs are jobs that are needed despite the economy. It does not matter how bad things are, most people are still going to use their dry cleaner and take the family out for a nice dinner, maybe not as often as before, but it will be a regular event. In-home entertainment is cheaper than going out to the movies, and everyone – especially someone who is stressed-out from unemployment, is going to want, needs, a little down-time. And, of course, you still need your physician, attorney and accountant. But recessions also, and ironically, provide opportunities for expansion. The most successful companies actually expand their activities during a recession. When times are good and something breaks, we buy new. When times are bad, we get things repaired. It can be anything from a refrigerator to a car. Repair, not replace, is the sign of bad times – or good times if you are the one making the repairs! Another example is continuing education. When you are unemployed, and it’s a buyer’s market – meaning few jobs a hordes of applicants – the best know that they have to better themselves. And the only way to do that is to enlarge and update your skills. I am not talking about getting a college degree. I am talking about going to a trade school and taking a six-week course on learning Microsoft Office, data entry, QuickBooks, whatever. But since we are on the topic of education, a lot of people will tell you that a college degree is important for you career. Nonsense! Don’t believe it for a minute. I have a B.A., an M.A., and a Ph.D. and I tell you categorically that having a college degree is NOT important. It’s CRITICAL! The September 2010 unemployment statistics put out by the US Department of Labor are indicative of what has been happening throughout the recession. The unemployment rate for 25-year olds without high school diplomas is 15.4%; 10% for high school graduates with no college; 9.1% for persons with some college or an Associate degree; and 4.4% for college graduates. Any questions? 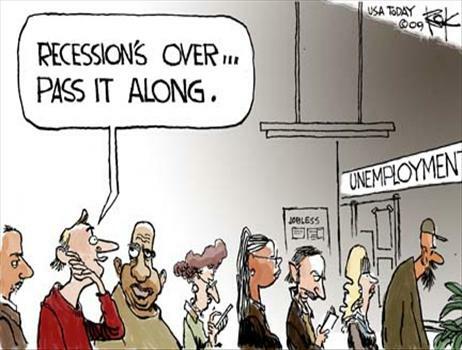 The funny thing is that a recession is a good time to be unemployed. Why? In good times employers are hesitant to hire people who are unemployed. During a recession, it’s not a big deal. It’s almost expected! Moreover, a candidate can show a prospective employer what he or she is made of. Too many unemployed sit around the house, watching television, collecting unemployment and feeling sorry for themselves. The good ones do something. They take on consulting or other short-term assignments. They go to school to learn new skills and update the ones they have. They make their job search their full-time job! All of this sends positive messages about a candidate’s character and work ethic to the prospective employer. If everyone keeps that in mind, maybe the recession will really be over!